Strikes from Jamille Matt and Brad Potts helped Blackpool earn their first FA Cup win since 2012 with a routine 2-0 victory over National League North side Kidderminster at Bloomfield Road. On a day when Blackpool supporters were once again protesting against club owners the Oyston family prior to kick-off, on the pitch the Seasiders did pick up just their second win in seven games. Kyle Vassell hooked the ball in for former Kidderminster striker Matt to nod home from six yards. And 10 minutes later the League Two side doubled their advantage as Potts surged forward from midfield before volleying past Samuel Hornby from 18 yards as the ball popped up off a defender. Gary Bowyer's side came close to a third just after the break as on-loan Leicester midfielder Michael Cain picked up the ball 20 yards out and curled an effort inches wide. 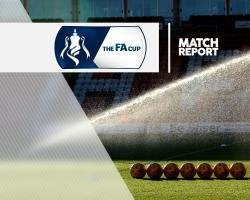 But Kidderminster did enough to ensure they were not on the end of a drubbing from their higher-ranked opponents, and threatened on a number of occasions. Emmanuel Dieseruvwe and Arthur Gnahoua both had second-half shots blocked from close range.